How tough is the Ironman Lanzarote bike course? It's among the most difficult course in the world. The average bike split is 6:43, nearly the same as Ironman St. George's 6:41. Why then, many people ask, is St. George ranked as notably tougher than Lanzarote overall? The answer is in the marathon: Lanzarote triathletes averaged a 4:26 run, those in St. George suffered through a 5:10 marathon. 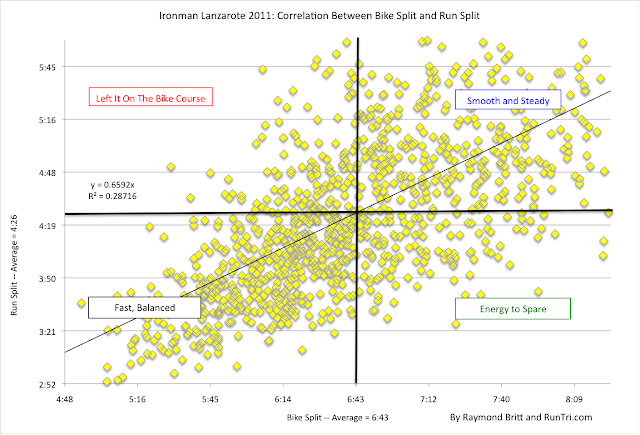 When it comes to balancing the bike (x, and 50% of total race time) and run (y = 66% of x), our analysis of IMLZ highlights four groups: 1. Fast and Balanced (Black label); 2. Energy to Spare (Green); 3. Left it on the Bike Course (Red); 4. Smooth and Steady (Blue) for a slow bike and slow run. Compared to St. George, more Lanzarote triathletes avoided the red and green zones. For more, see our Ironman Lanzarote Results analysis, our stats and analytics archive and our top 25 toughest Ironman triathlon rankings.